Iran's representatives at the seventh session of the United Nations Permanent Forum on Indigenous Issues (UNPFII) launched a bizarre attack on a delegation of Ahwazi Arab human rights activists, accusing them of responsibility for terrorism in the Middle East. Iranian delegates banged on the table throughout a speech by a representative of the Ahwaz Human Rights Organisation (AHRO), in a scene reminiscent of Kruschev's shoe banging incident in the UN General Assembly. 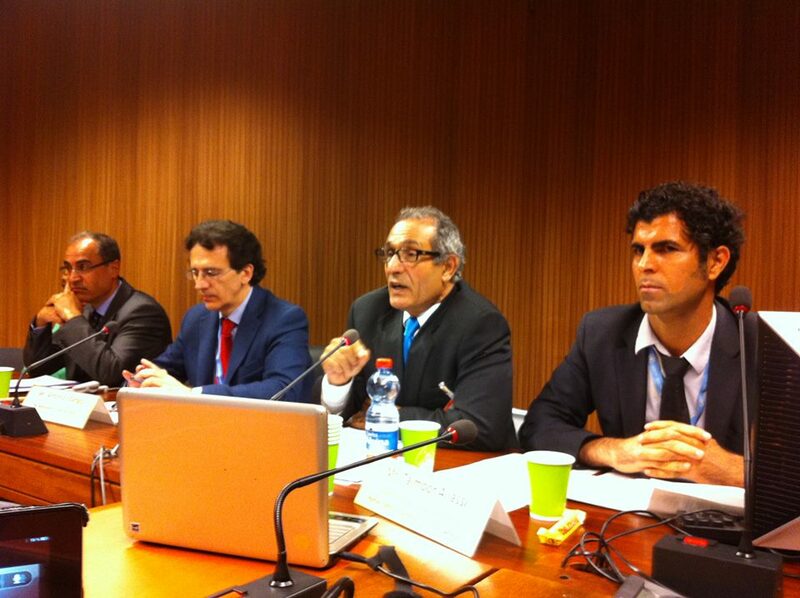 The Ahwazi delegate detailed Iran's catalogue of human rights abuses against indigenous Ahwazi Arabs. Delegates representing Iran's Balochi and Kurdish populations also adressed the session. A member of the Ahwazi Arab delegation told the British Ahwazi Friendship Society (BAFS) that as soon as their presentation started "all hell broke loose." The delegation criticised Iran for failing to appoint a member of Iran's national minorities, who comprise over half Iran's population, to represent the country at the PFII. This was proof that the Iranian government "does not aknowlege or recognize the indigenous peoples" of Iran. The Ahwazi Arab delegate drew attention to the historic marginalisation and discrimination against Ahwazi Arabs by successive governments. He said: "While Ahwazi ancestral lands produces 90% of Iran's vast oil revenue, none of this is allocated to the Ahwazis or to their region. Madam Chair: a proposed legislative bill allocating 1.5% of the oil revenue to the Khuzestan area or the indigenous Ahwazis has been defeated for the fourth year this year. "Iran indigenous Ahwazis are kept backward, poor and illiterate. The illiteracy rate is four times and unemployment is six times the national average ... Only one out of four Ahwazis graduates from high school. According to government's own data, 80% of the Arab children suffer from malnutrition. "In the past 12 months alone, at least 21 Ahwazi human rights and political activists were publicly hanged (three were executed just days after UN Human Rights Commissioner, Ms. Arbour, visited Tehran in September 2007) despite the appeal by the European Union Commission, international Human Rights Organization and in a blatant defiance to an appeal by the independent experts Mr. Philip Alston, Mr. Leandro Despouy, and Mr. Manfred Nowak who issued a statement urging the Iranian Government to 'stop the imminent execution of seven men belonging to the Ahwazi Arab minority and grant them a fair and public hearing.'" The Ahwazi Arab delegation called for the Special Rapporteur on Indigenous Peoples to "organise a fact finding trip to the province of Khuzestan to investigate land confiscation, ethnic cleansing and especially the killing of 151 indigenous Ahwazi-Arabs by Iranian security forces" since the April 2005 uprising. The Iranian delegate responded by saying: "This so-called NGO, AHRO, which is based in London is responsible for many bombings and explosions in Ahwaz. This so called NGO is secessionist and conducted the bombing in Ahwaz that killed many people." BAFS spokesman Nasser Bani Assad said: "The Iranian response at the PFII session was risible, yet predictable. The regime maintains anyone who supports indigenous rights in Iran is a secessionist and terrorist, without offering any supporting evidence. The fact that AHRO is based in Washington has not stopped Iran from claiming it is supported by British intelligence, which is Tehran's stock answer to any criticism of its treatment of its Arab population. Even if the delegation had sworn allegiance to the Supreme Leader, they would have been denounced as terrorists and separatists for even raising the issue of indigenous rights in Iran. "The unruly behaviour by the Iranian delegation went down poorly in the PFII session, which is usually a sober affair. Indigenous groups from across the world saw for themselves that the Iranian delegation wanted to silence and intimidate Ahwazi Arabs by banging on tables and making wild accusations. As a result, the Ahwazi delegation was applauded and received a warm response from NGOs and representatives of foreign governments. Iran's hysterical reaction backfired badly." Iran is represented on the UNPFII by Paimanach Hasteh, a US-educated environmental scientist who served as Director of the Department of Air Pollution Control of the Traffic Control Company in Tehran before taking up a career in the foreign ministry.